I keep telling people that the Gattegno books are a guide. Grab a notebook and learn along with your kids. You don't know where it will take you. We've been attempting to work through Gattegno's Textbook 1. 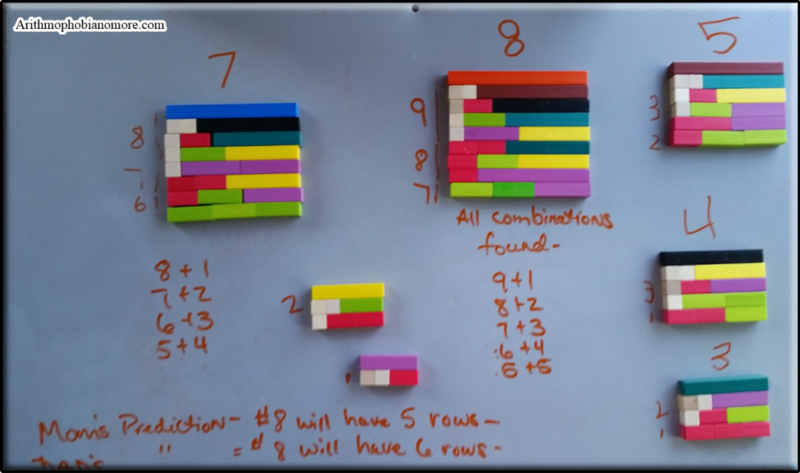 We are supposed to be on chapter 4 working with multiplication and fractions while studying the number 5, instead, we've been deconstructing numbers. We've been so distracted by our math questions that we haven't been able to get there yet. Given our experience with math, this is a fantastic problem to have: we've been so busy producing math, we don't have time to consume it. This post starts earlier with some work P. did. He chose to deconstruct 10; I added the constraints. My constraints were as follows: each train must contain 3 rods; the trains cannot repeat - so no permutations, 2 + 3 + 5 counts for 3 + 2 + 5 and 5 + 2 + 3 and so on. P's observations concerned how many of each rod appeared in the structure. He counted the number of trains. 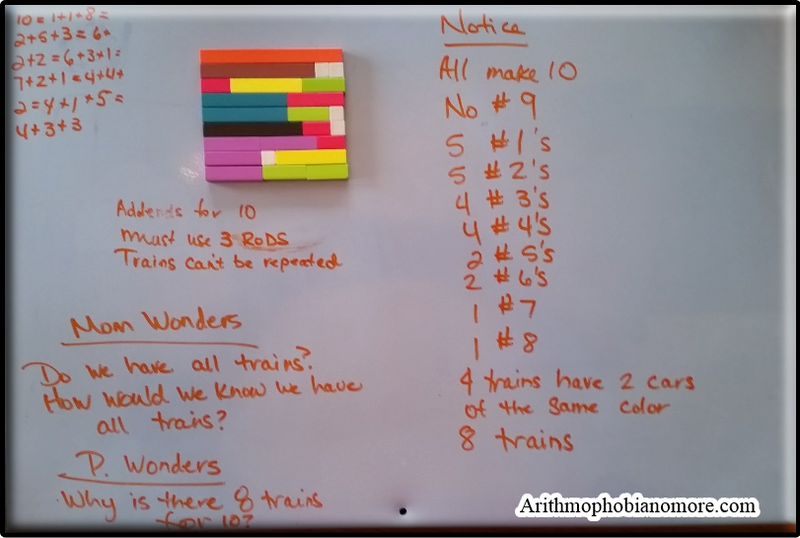 We made a prediction that there would be more trains than a structure for 10 that contained only 2-car trains. But he thought there would be more than 8. He wondered why only 8 trains. I wanted to know how we would know if we had all the trains. We thought we had them all, but how would we know for sure? After a bit of discussion, we decided to rearrange the trains starting with the trains that contained the largest rods first. Sunday morning P. came back to me with the idea that we can start with a white rod and then do all the complements for 9. Then we can use a red rod and do the complements for 8. This sounded like a good systematic plan, so we did it before church. We discovered we had indeed found all the complements the first time, but this time, we knew for sure. After 10 we went ahead and worked out the number 9. 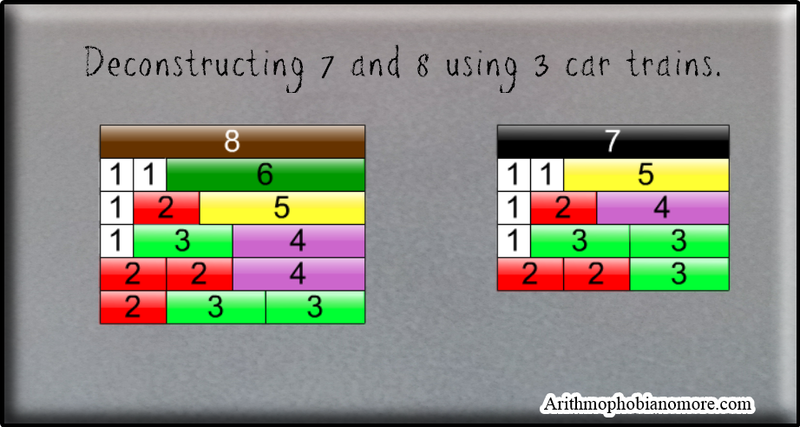 I used an online c-rods program for the following picture as our image was blurry and this one contained the numbers. 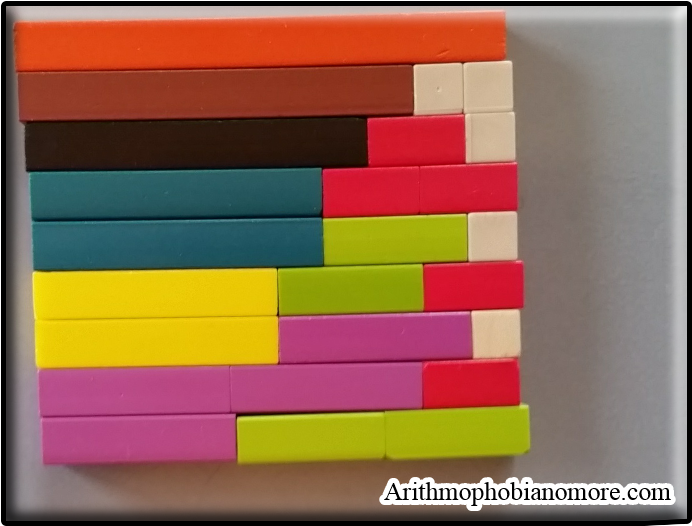 P. noticed that when we work the compliments starting with the largest, there is a clear pattern in the columns. It would be just as easy to start out with the pattern of 1 - 1, 1 - 2, 1 - 3, 1 - 4, 2 - 2, 2- 3, and so on until you run into duplicates. The last train in each structure contains a row that starts with 3. We are sure there is a connection to the number of complements and the number of 3 car trains, but we don't know what it is. The number 10 has eight trains, and the number 9 has seven trains. I predicted that the number 8 would have five trains because 9 is 3 squared and I suspected that would make for an extra train. Dad said nope, it would follow the same pattern, and the number 8 would contain six trains. I happened to be right about the number 8, but I am not sure that my reason was correct. As we worked backward from the number 8 to the number 3, each successive number contained one less train until we reached 4. The number 4 contained one train as did the number 3. We are still wondering why the number 10 contains eight 3-car trains and the number 9 contains seven 3-car trains but the number 8 only contains five 3-car trains. We are also wondering if there is a way to predict which train will be the last train. We aren't sure yet, but we think so. What will happen to the number of trains as we add more cars? We know that 2 cannot be made with a 3-car train and 3 cannot be made with a 4-car train. Will the number 10 have more or less than eight 4-car trains? Will there be a similar pattern as there is with the 3-car train? What happens if we extend this to 16 and 20? Will 16 have an extra 4-car train because it is a square of four? We wondered more than we had answers. We put it all away for another day. Deconstructing is messy. I left him asking lots of questions and loving math. That was my goal. 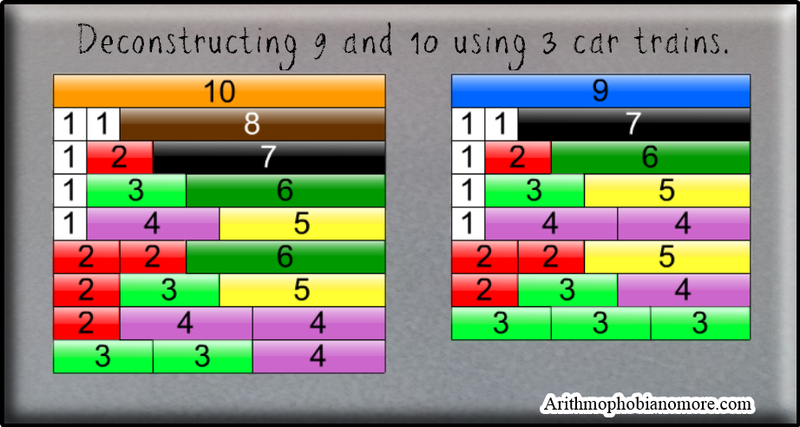 We can deconstruct numbers 1-10 without even thinking about it now. Our blurry mess before church.